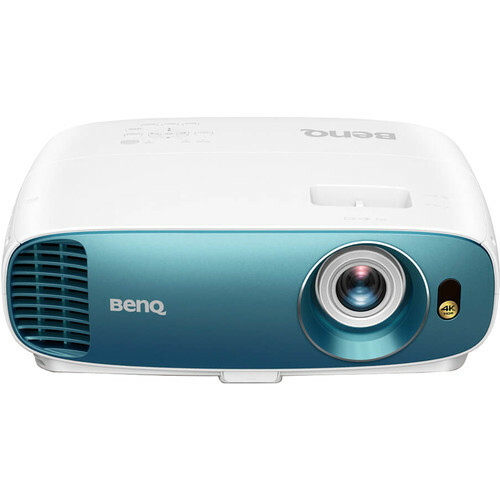 Enjoy your video games and multimedia content on a big screen with the BenQ TK800M HDR XPR 4K UHD DLP Home Theater Projector. It uses XPR technology to project UHD 4K resolution onto the screen with compatible content and features HDR10 and HLG compatibility to produce a wide color gamut. It outputs up to 3000 ANSI lumens of brightness and has a 10,000:1 dynamic contrast ratio to help produce details even in dark areas of the image. The projector has two HDMI inputs for connecting your digital HD devices such as a gaming console, Blu-ray player, or cable/satellite box. Its built-in 5W speaker eliminates the need for external speakers if none are convenient. The TK800M includes an IR remote control for additional convenience. 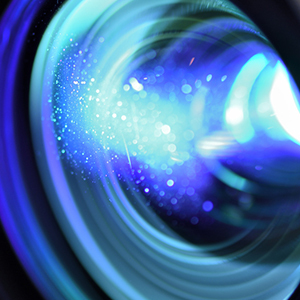 The single-DMD design avoids the alignment issues sometimes found in 3-chip projectors, helping to produce enhanced image integrity and color accuracy with minimized blur, shadowing, and interference patterns. The 7-element, 4-group lens array helps allow greater light penetration, and low-dispersion lens coatings minimize chromatic aberration for enhanced clarity. The TK800M achieves up to 96% of Rec. 709 color space for enhanced color accuracy for vivid colors, and the 120 Hz refresh rate helps minimize the blur commonly associated with fast-moving, on-screen objects. This technology helps keep the projector's color temperature unbiased, preventing greens and reds from becoming oversaturated for more lifelike color performance. HDR10 and HLG content support with Auto HDR Color Rendition technology provide greater brightness and contrast range than standard dynamic range (SDR) projectors, with image optimization in a single step. This also helps balance color saturation and color scale, preserving detail in dark areas of the image. Football Picture Mode helps preserve lifelike skin tones and green grass. Sport Picture Mode is engineered to render realistic shades of skin, warm wood tones, and vivid reds with balanced green and blue. The custom-tuned sound modes are designed to adjust audio characteristics to deliver enhanced A/V experiences for nearly any type of entertainment. Football Mode enhances mid-frequency and vocals from announcers in open-air stadiums. Sport Mode produces enhanced mid-frequency and vocals from announcers and clear acoustic details in indoor arenas. Cinema Mode is designed for immersive bass and high-frequency performance for an authentic real-world cinema presence. Music Mode helps produce a smoothly balanced performance for immersive live reproduction of music and concerts. Game Mode is engineered to provide enhanced bass and crisp highs to feel the excitement of intense gameplay. User Mode allows EQ algorithms to be individually customized to your preference. CineMaster Audio+ 2 helps produce an immersive A/V experience by combining EQ algorithms with a wide frequency range for deep bass and high highs. The aluminum full-range speaker driver and compartment are engineered to help produce pure vocals and delicate details without distortion or noise. Heat-resistant neodymium magnets help minimize distortion. The 0.47" DMD helps keep the design of the projector compact compared to projectors with larger chips. Keystone correction makes it simple to project properly aligned images from a variety of locations. The vertical keystone function counters the trapezoid effect for a properly squared image when the projector is placed off-center. SmartEco technology is designed to automatically adjust lamp brightness based on content to project richer blacks and increase contrast of image details. Eco Mode further extends projector lamp life up to 15,000 hours, minimizing lamp replacements and maintenance for an overall lower cost of ownership. The 1.1x zoom extends available space with a flexible range of throw distance for big-screen entertainment without the hassle of complicated installation. Box Dimensions (LxWxH) 19.7 x 13.6 x 7.12"
TK800M HDR XPR 4K UHD DLP Home Theater Projector is rated 5.0 out of 5 by 2. Rated 5 out of 5 by Greg from Awesome First Projector! This is my first projector and so far so awesome! Colors are bright and vibrant and the 4K image looks absolutely stunning. I don’t even have a proper screen yet so I can’t wait to see much better it looks with one of those. how is this different from the 2018 version?